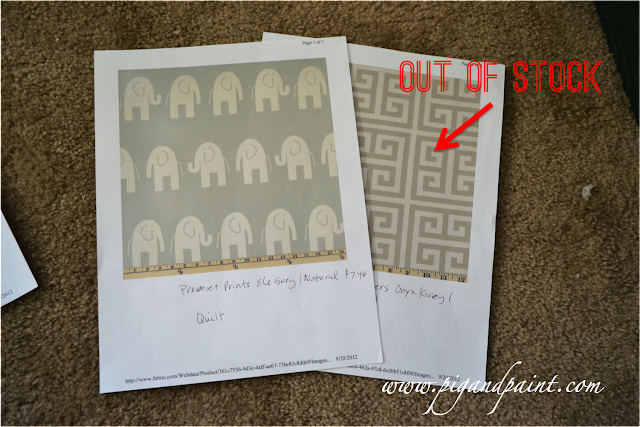 Earlier this week, I filled you in on my fabric plan, which included ordering all of my fabrics for the nursery from fabric.com. Well, I'm bummed to say my online ordering experience with fabric.com has not been great this time around, despite my previous positive experience. After having picked out all of my fabric at once from their site, I received an email a couple days after submitting my order, informing me that their inventory levels were incorrect on their site and that the TWO MOST IMPORTANT PIECES of fabric in my order would be removed from my order because they were out of stock. They apologized for the error, which they clearly acknowledged was their mistake. As a customer, I appreciate this kind of straight-forward acceptance of responsibility. But, I'm still bummed. I had selected all of my fabric to coordinate with each other, so now to have my two major players benched was kind of overwhelming. I almost asked them to cancel my entire order. But, alas, I did not. I'm going to take a stab at trying to find some replacement fabrics locally. And, in fabric.com's defense, they have a message on their home screen advising customers of the fulfillment issues they are currently having. They seem to be struggling with scaling their operations to accommodate their increased sales volumes, which I can completely understand....but disrupting the customer experience is always something we all want to avoid. I hope they are able to resolve their current issues, because I do plan to order from them again -- if they get their fulfillment systems and processes straightened out. I did submit an inquiry to fabric.com's customer service group to find out if my fabrics were simply on backorder to be shipped at a later date, or if I would never, ever receive the fabric. I'm awaiting a response. So much for trying to save time! But who knows....this project challenge could turn into an amazing win for the room design. Maybe I'll find the perfect substitute fabric -- something I like even better. Anybody else ever run into this type of issue? What project were you working on? 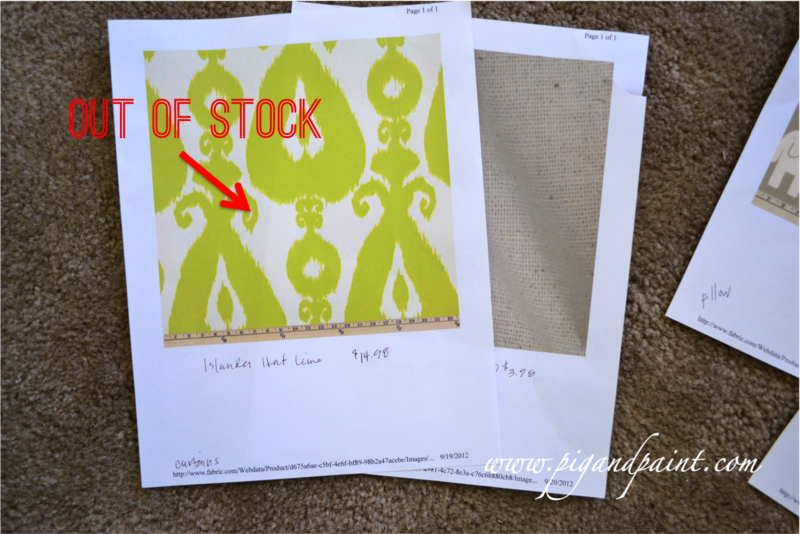 try Mary Jo's they might have the missing fabric. I have tons of luck finding "missing" and rare fabric on Etsy! I ordered Beatrix Potter fabrics on Etsy and the seller ended up being from Australia, which I didn't notice until I paid through paypal. But, they were less expensive and arrived quicker than the orders I had placed from U.S. sellers. My back up is Ebay. Good Luck!